Just months before the official opening of one of Christianity's holiest sites to visitors, the area where John the Baptist is said to have baptized Jesus remains surrounded by thousands of land mines. Israel says the sites visited by pilgrims and tourists in an area known as Qasr el-Yahud will be safe, but advocacy groups warn that crowds could be in danger. 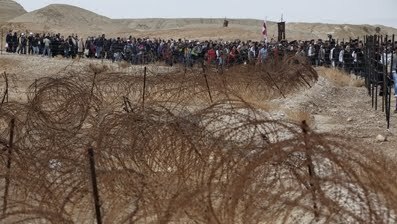 On Tuesday, some 15,000 Christian pilgrims marched between two fenced-in minefields to reach the Epiphany ceremony led by the Greek Orthodox patriarch on the Jordan River, five miles east of the oasis town of Jericho at the edge of the West Bank. Worshippers from around the world dipped themselves in the muddy waters, facing fellow believers on the other side of the small river. Orthodox clergymen dressed in dark frocks and robes chanted prayers as Patriarch Theofilos III blessed the waters, hurled branches and released white doves into the air. This site is Christianity's third holiest — after the Church of the Holy Sepulcher in Jerusalem, on the spot where Christian belief says Jesus was crucified and resurrected, and the Church of the Nativity in Bethlehem, where tradition holds Jesus was born — and the baptism marks the beginning of Jesus' public ministry. The ancient churches and monasteries on the Israeli side, some dating back to the fourth century, are surrounded by signs reading "Danger! Mines!" "Since it was a border, the place is really littered by hundreds and hundreds of mines, and therefore the area is not open to the public and to the believers and pilgrims," said Avner Goren, an archaeologist who works with Israel's Tourism Ministry. The ministry says about 60,000 people visit each year, but with the upcoming official opening that number is expected to rise to the millions. No date for the opening has been set. The Israeli military says the baptism site and adjacent churches are located in a "completely mine-free zone," and insists "no danger is posed to tourists or worshippers." "The (military) regularly clears away minefields in the Jordan River Valley, and in the last year alone approximately 8,000 mines have been removed from the area," the military said in a statement. Dhyan Or, the Israel director of the global anti-mining advocacy group Roots of Peace, said there are half a million mines in the Jordan Valley — an area prone to floods. He warned that land mines could drift from the fenced areas, and that overzealous worshippers could stray from the marked paths. "There is no political problem to remove the mines and no technical problem to do so," he said. "All that is missing is the political will." In contrast, Jordan cleared the minefields on its side of the border after signing a peace deal with Israel in 1994. Jordan has developed a cultural heritage center on its side across the narrow river from the West Bank shrine, claiming it as the site of the baptism. The center has attracted millions of tourists. Pope John Paul II visited the Jordanian site in 2000, reinforcing the Jordanian claim.